Red Dead Redemption 2 is a Western action-adventure game developed and published by Rockstar Games. It was released on October 26, 2018, for the PlayStation 4 and Xbox One consoles. The third entry in the Red Dead series, it is a prequel to the 2010 game Red Dead Redemption. Set in 1899 in a fictionalized version of the Western United States, the story centers on outlaw Arthur Morgan, a member of the Van der Linde gang dealing with the decline of the Wild West whilst attempting to survive against government forces, rival gangs, and other enemies. The story also follows fellow gang member John Marston, protagonist from the first Red Dead Redemption. Red Dead Redemption 2[lower-alpha 1] is a Western action-adventure game developed and published by Rockstar Games. It was released on October 26, 2018, for the PlayStation 4 and Xbox One consoles. The third entry in the Red Dead series, it is a prequel to the 2010 game Red Dead Redemption. Set in 1899 in a fictionalized version of the Western United States, the story centers on outlaw Arthur Morgan, a member of the Van der Linde gang dealing with the decline of the Wild West whilst attempting to survive against government forces, rival gangs, and other enemies. The story also follows fellow gang member John Marston, protagonist from the first Red Dead Redemption. Red Dead Redemption 2 is presented through both first and third-person perspectives, and the player may freely roam in its interactive open world. Gameplay elements include shootouts, heists, hunting, horseback riding, interacting with any non-player character (NPC), and maintaining the character's honor rating through moral choices and deeds. A bounty system similar to the "wanted" system from the Grand Theft Auto franchise governs the response of law enforcement and bounty hunters to crimes committed by the player. Red Dead Online, the online multiplayer mode of the game, was released as a beta version in November 2018. Broadly anticipated and marketed before release, Red Dead Redemption 2 broke several records and had the second-biggest launch in the history of entertainment, generating $725 million in sales from its opening weekend and shipping over 23 million copies in retail. It was universally acclaimed by critics, who praised the story, characters, open world, and considerable level of detail. Red Dead Redemption 2 received a number of perfect scores and awards, including the "Critic's Choice Award" at the 2018 Golden Joystick Awards, and honors such as "Best Narrative" and "Best Score/Music" at The Game Awards 2018. The player may choose to respond positively or negatively to non-playable characters throughout the game world, which affects their reputation within the game. Red Dead Redemption 2 is a Western-themed action-adventure game. Played from a first or third-person perspective, the game is set in an open-world environment featuring a fictionalized version of the Western U.S. The game features both single-player and online multiplayer components released under Red Dead Online. The player controls outlaw Arthur Morgan, member of the Van Der Linde gang, as he completes numerous missions—linear scenarios with set objectives—in order to progress through the story. Outside of missions, the player may freely roam its interactive world. The player may engage into combat with enemies using melee attacks, firearms, or explosives. Combat has been refined from the game's predecessor, and notable new mechanics consist of dual-wielding and the ability to use a bow. Unlike in the previous game, the player is granted the ability to swim. Red Dead Redemption 2's unexploited land makes up the largest portion of the game world, and features diverse landscapes with occasional travelers, bandits, and wildlife. There are urban settlements in the game, ranging from farmhouses, to towns and cities. Horses are the main forms of transportation, of which there are various breeds, each with different attributes. The player must either train or tame a wild horse in order to use it, with the exception of stolen horses; however they must saddle a horse in order to acquire ownership over it. Increased use of a horse will begin a bonding process, which can be increased by cleaning and feeding it, and the player will acquire advantages as they ride their horse. Stagecoaches and trains can also be used to travel. The player can also hijack an incoming train or stagecoach by threatening the driver or passengers, and then rob its contents or the passengers. The player may also witness or take part in random events encountered from exploring the game world. These include ambushes, crimes committed by other people, pleas for assistance, ride-by shootings, public executions, and animal attacks. For example, as Arthur explores the Wild West, he can find specific people in distress. If he decides to help them, they will be thankful and may reward Arthur if he crosses them again. The player may also take part in side-activities. These activities include small tasks with companions and strangers, dueling, bounty hunting, searching for treasure or other collectibles around the map such as rock carvings, and mini-games like poker, blackjack, dominoes, and Five Finger Filet. Hunting animals also plays a major role in the game, providing food, income, and materials for crafting items. When hunting, players need to take into account several factors, including the choice of weapon and shot placement, which affect the quality of the meat and pelt and subsequently the price traders are willing to pay. Players can either skin the animal immediately or carry the carcass, which will rot over time and decrease its value and attract predators. The game focuses heavily on player choice for the story and missions. Certain moments in the story will give players the option to accept or decline additional missions and lightly shape the plot around their choices. The player can communicate with any NPC in dynamic ways new to the series. Arthur can choose different dialogue trees with NPCs, such as having a friendly chat, or insulting them. If the player chooses to kill an NPC, they can loot their corpse. Red Dead Redemption 2 brings back the Honor system from its predecessor by measuring how Arthur's actions are perceived in terms of morality. Morally positive choices and deeds like helping strangers, abiding the law, and sparing opponents in a duel will add up to the player's Honor. However, negative deeds such as theft and harming innocents, will subtract from the player's Honor. The story is influenced by Honor, as the dialogue and outcomes for Arthur often differ based on his Honor level. Hitting milestones for Arthur's Honor level will grant unique benefits, such as rewarding the player with special outfits and large discounts in stores. A low Honor level is also beneficial, as Arthur will receive a greater number of items from looted corpses. Maintaining Arthur is important, as he can undergo conditions that may affect some of his cores, such as his health and stamina. For example, wearing warmer clothes will mean he avoids freezing in a cold environment, but wearing them in a hot environment will result in him perspiring. Arthur can also gain or lose weight depending on how much he eats, a feature absent from previous Rockstar games since Grand Theft Auto: San Andreas. An underweight Arthur will have less health but at an increase of stamina, while an overweight Arthur will be able to better absorb damage but will have less stamina. The player can bathe to remain clean, and can visit a barber to change hairstyles; Arthur's hair also grows realistically over time. The game features item degradation, with equipment such as weapons requiring cleaning. When Arthur uses a certain type of gun for a long period of time, he becomes more experienced with it, which improves weapon handling, reduces recoil, and increases the rate of reloading. Arthur can also sleep in order to replenish his cores. Gunfights are an essential mechanic in the game. The player can take cover, free aim, and target a person or animal. Individual body parts can also be targeted in order to take targets down without killing them. When the player shoots an enemy, the game's AI reactions and movements depend on where they were hit. Weapons consist of pistols, revolvers, repeaters, rifles, shotguns, bows, explosives, lassos, mounted Gatling guns and melee weapons such as knives and tomahawks. Red Dead Redemption 2 brings back the trademark mechanic in the franchise: the Dead Eye, a targeting system that allows the player to slow down time and paint targets. Once the targeting sequence ends, Arthur fires to every marked location in a very short space of time. The Dead Eye system upgrades as the player progresses in the game, and will grant the player more abilities, such as being able to spot the fatal points of their enemies. The bounty system also returns from Red Dead Redemption, a crime-governing mechanic inspired from Grand Theft Auto's wanted system. When a player commits a crime, witnesses will run to the nearest police station to get the law to intervene, and the player will need to stop the witness in order to avoid repercussions. Once the law is alerted, law enforcers appear and will start investigating. When the player is caught, the Wanted meter appears with a bounty sent on their head. The bounty grows higher as the player commits more crimes, and more lawmen will be sent to hunt them. If the player has committed serious crimes and then manages to escape the law, bounty hunters will be hired to track them down in the wilderness. After committing enough crime, the U.S Marshals will be sent to the player's location. In order to escape law enforcement, the player must evade a red circular zone in the map and the wanted meter will slowly deplete. They can alternatively hide from the pursuers or kill them. Whether the player escapes or gets captured, the bounty will remain on their head, lawmen and civilians will be more vigilant, and regions where the crimes have been committed will be on lockdown. When caught by lawmen, the player has the opportunity to surrender if they are unarmed and on foot, however, bounty hunters will not accept surrender. The player can only get rid of their bounty by paying it off at a post office. The world of Red Dead Redemption 2 spans five fictitious states of the United States. The states of New Hanover, Ambarino and Lemoyne are new to the series, and are located to the immediate north and east of Red Dead Redemption's world, whilst the states of New Austin and West Elizabeth return from Red Dead Redemption. [lower-alpha 2] West Elizabeth has been expanded to include new regions. The states are centered on the San Luis and Lannahechee Rivers and the shores of Flat Iron Lake. Ambarino is a mountain wilderness, with the largest settlement being a Native American reservation; New Hanover is a wide valley that has become a hub of industry; and Lemoyne is made up of bayous and plantations resembling Louisiana, and is home to the former French colony of Saint Denis, analogous to New Orleans. West Elizabeth consists of wide plains, dense forests, and the modern town of Blackwater. This region has been expanded from the original Red Dead Redemption to include a vast northern portion containing the small town of Strawberry. New Austin is an arid desert region centered on the frontier towns of Armadillo and Tumbleweed, also featured in the original Red Dead Redemption. The player takes on the role of Arthur Morgan (Roger Clark), a lieutenant and veteran member of the Van der Linde gang. The gang is led by Dutch van der Linde (Benjamin Byron Davis), a charismatic man who extols personal freedom and decries the encroaching march of modern civilization. The gang also includes his best friend and co-leader Hosea Matthews (Curzon Dobell), Red Dead Redemption protagonist John Marston (Rob Wiethoff), Bill Williamson (Steve J. Palmer), Javier Escuella (Gabriel Sloyer), Micah Bell (Peter Blomquist), the elderly Uncle (James McBride and John O'Creagh), African-American member Lenny Summers (Harron Atkins), native-American hunter Charles Smith (Noshir Dalal), turncoat O'Driscoll Kieran Duffy (Pico Alexander), Sadie Adler (Alex McKenna), Irishman Sean MacGuire (Michael Mellamphy), cook Simon Pearson (Jim Santangeli), loan shark Leopold Strauss (Howard Pinhasik), Dutch's lover Molly O'Shea (Penny O'Brien), taskmaster Susan Grimshaw (Kaili Vernoff), Tilly Jackson (Meeya Davis), Karen Jones (Jo Armeniox), Mary-Beth Gaskill (Samantha Strelitz), reverend Orville Swanson (Sean Haberle), and Abigail (Cali Elizabeth Moore) and Jack Marston (Marissa Buccianti and Ted Sutherland), John's partner and son respectively. The gang's allies include conman Josiah Trelawny (Stephen Gevedon), and Arthur's former partner, Mary Linton (Julie Jesneck). The gang's criminal acts bring them into conflict with various opposing forces including the wealthy oil magnate Leviticus Cornwall (John Rue), whose assets become a gang target. In response he recruits a team of agents from the Pinkerton Detective Agency, led by Agent Milton (John Hickok) and his subordinate Agent Ross (Jim Bentley), to hunt down the gang. The gang also encounter the Saint Denis-based Italian crime lord Angelo Bronte (Jim Pirri), and Dutch's nemesis Colm O'Driscoll (Andrew Berg), leader of the rival O'Driscoll gang. More enemies include the Del Lobo, Laramie, Skinner, Murfree, and Lemoyne Raiders gangs, and the warring Gray and Braithwaite families. Other characters include Rains Fall (Graham Greene) and Eagle Flies (Jeremiah Bitsui), members of the Native American Wapiti tribe. After a botched ferry heist in 1899 results in the deaths of several members, the Van der Linde gang flees Blackwater, forced to leave behind their substantial money stash. Realizing that the progress of civilization is ending the time of outlaws, the gang decides to gain enough money to escape the law and retire. They rob a train owned by Leviticus Cornwall, who responds by hiring Pinkerton agents led by Andrew Milton to apprehend them. The gang perform numerous jobs and heists, as Dutch continually promises that the next heist will be their last. Following a successful bank heist in Valentine, and a deadly shootout with Cornwall's men, the gang relocate to Lemoyne. They meet the Grays and Braithwaites, two warring families potentially hoarding civil war gold. Dutch pits the families against each other, but his actions are uncovered, resulting in an ambush by the Grays, which kills gang member Sean, and the Braithwaites kidnapping John's son, Jack. The gang retaliates against both families, and learns that Jack is with Saint Denis crime lord Angelo Bronte. Bronte returns Jack and embraces the gang, but then lures them into a trap. Dutch seeks vengeance, kidnapping Bronte with the gang and then feeding him to an alligator. At this point, Dutch has grown convinced that there is no future for the gang in the United States and leads them in a bank robbery at Saint Denis to get enough money to move overseas. The Pinkertons intervene, killing Hosea and Lenny, and arresting John. Dutch, Arthur, Bill, Javier and Micah escape the city via a ship heading to Cuba. A torrential storm sinks the ship, and the men wash ashore the isle of Guarma, where they become embroiled in a war between the tyrannical sugar plantation owners and the enslaved local population. The group successfully aids the revolution against the plantation owners, and secures transport back to the US. The group reunite with the rest of the gang, and Dutch obsesses over one last heist. Although he insists that they must wait to liberate John, Arthur and Sadie disobey Dutch to rescue him. Dutch begins to doubt Arthur's loyalty, in part facilitated by Micah's manipulations, who has eagerly taken Hosea's role as Dutch's advisor. Arthur meanwhile becomes concerned that Dutch is no longer the man he knew, increasingly resorting to murder and paranoia, and abandoning their ideals. Arthur later discovers that he has contracted tuberculosis following an altercation with a diseased farmer, giving him only a short time to live. Faced with his own mortality, Arthur reflects on his actions and how to protect the gang following his death. After fending off a Pinkerton assault on the camp, Dutch becomes paranoid that a gang member is working as an informant, causing their failures. After relocating again, Dutch manipulates a local Native American tribe into a conflict with the United States Army to draw attention away from the gang. Several gang members become disenchanted and leave, while Dutch and Micah arrange one final heist of an Army payroll train. Arthur convinces John that following the heist he must leave and start a new life with his family. Dutch later murders Cornwall, blaming him for the Pinkertons' actions. Arthur's faith in Dutch is shattered when he seemingly abandons Arthur to the Army, leaves John for dead during the heist, and refuses to rescue John's captured partner Abigail. Arthur and Sadie again disobey Dutch to rescue Abigail. They kill Milton, after learning that Micah has been working for the Pinkertons since returning from Guarma. The gang collapses after Arthur returns to Dutch, openly accusing Micah of betrayal. Dutch, Bill, Javier and Micah turn on Arthur and John when the Pinkertons arrive, but all six manage to escape into the wilderness. Under pursuit, Arthur accepts his impending death, and either aids John's escape by delaying the Pinkertons, or returns to the camp to recover the gang's money. Micah ambushes Arthur and Dutch intervenes in their fight. Arthur convinces Dutch to abandon Micah and leave. If Arthur was played honorably, Arthur succumbs to his disease while watching the sunrise, otherwise Micah executes him. Eight years later in 1907, John and his family are leading an honest life. Finding work at a ranch, John is forced to fight back against outlaws threatening his employer. Believing John will never escape his old life, Abigail leaves with Jack. This encourages John to take out a bank loan and purchase his own ranch, working with Uncle and Charles to build a new home. On Abigail's return, John proposes to her. Against her wishes, John, Sadie and Charles pursue Micah after learning of his location. They unexpectedly find Dutch again working with Micah, but Dutch shoots Micah and leaves in silence, allowing John to finish him off. The Blackwater stash recovered by Micah is used to pay off John's bank loan. Later, John marries Abigail, and they start their new life on their ranch, alongside Jack, Uncle, Sadie, and Charles. After, Sadie and Charles leave for other pursuits. Milton's former partner Edgar Ross, now an agent for the Bureau of Investigation, discovers Micah's corpse. He and his partner Archer Fordham follow the trail back to John's ranch, initiating the events of Red Dead Redemption. The fates of the surviving gang members are revealed in newspaper articles, letters, NPC dialogue, random encounters, and several mid-credit scenes: Pearson opened a general store, Swanson became a priest, Tilly married a lawyer, Mary-Beth became a writer, Karen presumably drank herself to death, and Strauss was arrested and killed in captivity. 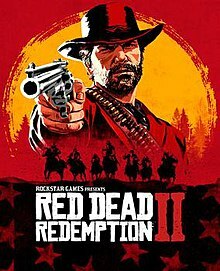 Red Dead Redemption 2 was developed by Rockstar Studios, a collaborative effort between all of Rockstar Games' studios functioning as a single team, using the proprietary Rockstar Advanced Game Engine (RAGE). Woody Jackson, who co-composed the score of Red Dead Redemption, reprises his role. The game was announced in October 2016. In the two days prior, the company had used various social media platforms as well as their own website to release two teaser images in the color and theme of Red Dead Redemption. The teaser images led to considerable attention and raised the stock price of its parent company Take-Two Interactive by nearly six percent. On the day of its announcement for PlayStation 4 and Xbox One, some fans started petitioning Rockstar Games for the game to be made available on Microsoft Windows as well. Per an exclusivity agreement with Sony Interactive Entertainment, certain online game content will be timed exclusives for the PlayStation 4. Originally due for release in the second half of 2017, the game was delayed twice: first to Q1/Q2 2018, and later to October 26, 2018. The online multiplayer portion of the game called Red Dead Online was released as a closed beta on November 27, 2018, and unlocked for all players on November 30. During an IGN Q&A session with various Rockstar developers, when asked why it would not be available simultaneously with the base game, design director Imran Sarwar answered "Red Dead Redemption 2 is an absolutely massive story-based game that we hope people will be lost in for a long time and we want people to experience everything that world has to offer before we build on that with the Online experience" while also stating that "we [at Rockstar] see them essentially as separate products that will grow and evolve independently of each other" and saying that the team has learned after launching online games that there are bound to be a few issues and that they wish to roll out the game as smoothly as possible. It was also mentioned that the game takes many of the favorite elements of Grand Theft Auto Online while also further expanding the original game's ideas. The game's debut trailer was released on October 20, 2016, depicting the open world environment, and the second and third trailers—released on September 28, 2017, and May 2, 2018, respectively—introduced the game's characters and story. A trailer released on August 9 features the first gameplay footage. It demonstrates the shooting and horse mechanics, and the ability to maintain the player's gang and camps. To spur pre-order sales, Rockstar collaborated with several retail outlets to provide special edition versions of the game. The "Special Edition" includes exclusive single-player content, while the "Ultimate Edition" features additional online content. The "Collector's Box" is a collection of physical merchandise relating to the game. Red Dead Redemption 2 received "universal acclaim" from critics, according to review aggregator Metacritic. It is the highest rated PlayStation 4 and Xbox One game on Metacritic alongside Rockstar's Grand Theft Auto V.
Game Informer awarded the game a perfect score writing: "Rockstar Games has outdone itself again with Red Dead Redemption II. The up-close portrayal of the outlaw Van der Linde gang's unraveling is a compelling companion story that blends seamlessly with the original game, and depth and breadth of the open world is a technical triumph that every gamer should experience." IGN also awarded the game full marks, commenting "Red Dead Redemption 2 stands shoulder-to-shoulder with Grand Theft Auto V as one of the greatest games of the modern age. It's a gorgeous depiction of an ugly period that's patient, polished, and a huge amount of fun to play, and it's combined with Rockstar's best storytelling to date. Even after finishing the lengthy story I can't wait to go back and play more." In another full score review, Electronic Gaming Monthly wrote: "Criticisms often come easier than compliments, but in the case of Red Dead Redemption 2, I am at a loss. This is one of the most gorgeous, seamless, rootinest, tootinest games ever made, and if you voluntarily miss out on it, you're either not a gamer or in a coma." USgamer said, "[i]s Red Dead Redemption 2 better than the first game? Very much so. Is Red Dead Redemption 2 perfect? No. Rockstar Games has crafted this huge, beautiful world with an attention to detail that's astounding..." and summarised by saying "Red Dead Redemption 2 is a fantastic game that should keep players satisfied for another eight years." Alessandro Fillari of GameSpot praised the story, characters, and animation, and said "Red Dead Redemption 2 is an excellent prequel, but it's also an emotional, thought-provoking story in its own right, and it's a world that is hard to leave when it's done." Peter Suderman, writing for The New York Times, considered Red Dead Redemption 2 as an example of video games as a work of art, comparing the game's abilities to "[tell] individual stories against the backdrop of national and cultural identity, deconstructing their genres while advancing the form" to the current state of film and television with similar works like The Godfather and The Sopranos. Some criticism focused on the game's control system, which was described as "clunky" and "outdated". Push Square called the controls "serviceable" but at their worst "infuriating", and that the button layouts for various actions were too convoluted. Forbes criticized the game for having a noticeable input lag and found that "things aren't as tight as they need to be", in another article writing that it "often feels like an absolute slog when it comes to the actual controls, mechanics and UI of the game". USgamer was disappointed that Red Dead Redemption 2 fundamentally used the same control scheme that had been present in Rockstar titles since the release of Grand Theft Auto IV in 2008, and questioned why it had not been sufficiently improved upon in that time. Reviewers also critiqued how the focus on authenticity translated to gameplay and player convenience. Gaming journalist Jim Sterling felt that the sheer amount of realism in the game limited capabilities and caused various scenarios or animations to be prolonged. Additionally, Forbes and VentureBeat found that despite its focus, the level of realism was concurrently lacking; discrepancies were noted between the game's sense of immersion and its presenting of mechanics which defied the laws of physics and animations they considered unrealistic. VentureBeat also felt that in spite of presenting a range of options, the gameplay was still notably restrictive. Wired were also mixed on gameplay elements relating to the well-being of the player character and the required dedication, writing "In its perfection, RDR2 exchanges immersion for observation. At times, the constant character maintenance feels like a chore..." and that it "sometimes gets bogged-down in the RPG-like intricacies of keeping going in the game world." Since the previous installment in the series was among the best-selling games of the seventh generation of video game consoles, many analysts believed that Red Dead Redemption 2 would be one of the highest-selling games of 2018 and would have a great effect on other game sales during the fourth quarter. When discussing the delay until October 2018, a writer from Forbes said "A huge arrival for [Red Dead Redemption 2] could be a crater that dampens sales of all competitors in that window, so I have to imagine this shockwave is being felt pretty hard right now around the industry." In July 2018, The NPD Group, a market research company, published an article titled "Video Game Industry Predictions for Holiday 2018", where author and industry analyst Mat Piscatella predicted that Red Dead Redemption 2 would be the best-selling game of 2018, outselling other blockbuster titles like Call of Duty: Black Ops 4, Battlefield V, and Fallout 76. Red Dead Redemption 2 is the best-selling retail game in its first week of release and the second-fastest-selling game of 2018 in the UK, behind FIFA 19. The game's opening week UK physical sales were doubled from its predecessor's with 68% of sales being the PS4 version and the remainder on the Xbox One. Red Dead Redemption 2 is also the third-fastest-selling non-FIFA game released this generation, behind Call of Duty: Black Ops 3 and Call of Duty: Advanced Warfare. Within its first week on sale in Japan, the PlayStation 4 version of Red Dead Redemption 2 sold 132,984 copies, which placed it at number one on the all format video game sales chart. Rockstar Games announced that Red Dead Redemption 2 had the largest opening weekend in the history of entertainment, making over $725 million in revenue in three days, and over 17 million copies shipped in total in two weeks, exceeding the lifetime sales of Red Dead Redemption. Additionally, Red Dead Redemption 2 is the second highest-grossing entertainment launch (behind Grand Theft Auto V) and set records for largest ever preorders, largest first-day sales and largest sales for the first three days in market on PlayStation Network. As of February 2019, the game has shipped over 23 million copies. In an interview with Harold Goldberg of the New York magazine published on October 14, 2018, Dan Houser, Rockstar Games' co-founder and vice-president for creative, and head writer for Red Dead Redemption 2, stated that they had been working 100-hour weeks "several times in 2018". Many sources interpreted this statement as "crunch time" for the entire development staff of the game, comparable to similar accusations made by wives of Rockstar San Diego employees in regards to the development of the game's predecessor, with Rockstar Games receiving strong criticism. In a statement sent by Rockstar to various media outlets the following day, it was clarified that the work duration mentioned by Houser only affected the senior writing staff for Red Dead Redemption 2, which comprised himself, Michael Unsworth, Rupert Humphries and Lazlow Jones, and that the duration had only been the case for three weeks during the entire development. Houser also added that the company would never expect or force any employee to work as long as was stated, and if anyone was staying late at the development studios, it would be due to their passion for the project. However, other Rockstar employees argued that Houser's statements did not give an accurate picture of the "crunch-time culture" at the company that many of its employees worked under, which included "mandatory" overtime and years-long periods of crunch. Due to the salary-based nature of employment contracts, many of these employees were not compensated for their overtime work and instead depended on year-end bonus payments that hinged on the sales performance of the game. Nonetheless, a sentiment echoed across many employee statements was the observation that working conditions had somewhat improved since development on the original Red Dead Redemption, which had been so demanding that a number of the developers' spouses had voiced their disapproval to Rockstar. In early November 2018, YouTuber Shirrako posted several videos of his player character murdering a female suffragette NPC, including feeding her to an alligator and dropping her down a mineshaft. The videos were both applauded and criticized by YouTube users. In response, YouTube suspended the channel for violation of their community guidelines, citing its graphic nature for shock purposes and for promoting violence. Audiences, including other channels, protested the decision. Conversely, the channel had also published additional videos of similar actions to other non-playable characters, such as those from the Ku Klux Klan. On November 8, 2018, YouTube restored the channel and designated an age restriction to the suffragette videos, commenting "Sometimes we make mistakes, which is why we have multiple escalation paths for reviewers to raise tough decisions and we give creators the right to appeal. The reviewer will be educated on this outcome and on how to avoid repeating this mistake." Rockstar received a cease and desist notice from Securitas AB, the parent company of the modern day Pinkerton National Detective Agency. Securitas asserted that Red Dead Redemption 2's use of the Pinkerton name and badge imagery was against their trademark of both marks, and demanded royalties for each copy of the game sold or that they would take legal action. Rockstar instead filed a complaint against Securitas in January 2019, asserting that the Pinkerton name was strongly associated with the Wild West, and their use of the term did not infringe on the Pinkerton trademark. Rockstar is seeking a summary judgement to declare the use of Pinkerton in the game as allowed fair use. ↑ The Mexican state of Nuevo Paraiso which featured in Red Dead Redemption is not a part of the new game world. ↑ St Leger, Henry (November 7, 2018). "Red Dead Redemption 2 guides, character list and reviews". TechRadar. ↑ Cryer, Hirun (December 20, 2018). "How to Dual Wield Guns in Red Dead Redemption 2 - How to Unlock the Second Gun Holster in Red Dead 2". Usgamer. ↑ Frank, Allegra (September 28, 2017). "Red Dead Redemption 2 trailer has bows and arrows, after years of requests". Polygon. ↑ Watts, Steve (September 20, 2018). "In Red Dead Redemption 2, Arthur Can Swim, Unlike John Marston". GameSpot. ↑ Aitken, Lauren (21 December 2018). "Red Dead Redemption 2 guide and walkthrough for Rockstar's open world western". VG247. ↑ Cryer, Hirun (December 20, 2018). "Red Dead Redemption 2 Map - Complete Map Overview, How to Unlock the Whole Red Dead 2 Map". USgamer. ↑ "Horses Guide - Locations, Stats, Bonding, Taming, and Breeds". IGN. ↑ Faulkner, Jason (October 25, 2018). "Red Dead Redemption 2 How to Rob a Train and Stagecoach". GameRevolution. ↑ Petite, Steven (October 30, 2018). "'Red Dead Redemption 2': How to fast travel to get around quickly". Digital Trends. ↑ Cook, Adam (October 29, 2018). "These are the 6 minigames you need to play in Red Dead Redemption 2". Red Bull. ↑ "Random Encounters - Red Dead Redemption 2". IGN. ↑ "Stranger / Companion Side Mission List & Locations". GameWith. ↑ Stevens, Colin (September 28, 2018). "Red Dead Redemption 2 Hunting, Fishing and Wildlife Detailed". IGN. ↑ Gurwin, Gabe (November 8, 2018). "Red Dead Redemption 2: How to hunt like a pro". Digital Trends. ↑ Simmons, Alex (May 3, 2018). "World's First Look at Red Dead Redemption 2". IGN. ↑ Parkin, Jeffrey (November 19, 2018). "Red Dead Redemption 2 guide: making money". Polygon. ↑ Cryer, Hirun (January 2, 2019). "Red Dead Redemption 2 Honor Level Guide - Honor Reward Levels, How to Increase and Decrease Your Honor Rank". Usgamer. ↑ Jecks, Chris (October 25, 2018). "Red Dead Redemption 2: How to Gain Weight, Get Fat & Lose Weight Fast". Twinfinite. ↑ Nicol, Haru (October 25, 2018). "Red Dead Redemption 2 Temperature – How to Keep Warm and Cool". GameRevolution. ↑ Maher, Cian (November 12, 2018). "Red Dead Redemption 2 Weapon Degradation Tips – How to Clean Your Weapons in RDR2". GameRevolution. ↑ Hussain, Tamoor (October 25, 2018). "Red Dead Redemption 2's DNA: How GTA5, Bully, LA Noire, And More Influenced The Sequel". GameSpot. ↑ Martin, Matt (January 3, 2019). "Red Dead Redemption 2 Dead Eye tips – how to level up Dead Eye, auto target, critical shots, more". VG247. ↑ "Combat guide: weapons, stealth, melee, and Dead Eye - Red Dead Redemption 2". ShackNews. ↑ Tapsell, Chris (December 21, 2018). "Red Dead Redemption 2 Bounty and Wanted level - how to pay bounties and lose your wanted level explained". Eurogamer. ↑ Thielenhaus, Kevin (October 31, 2018). "Red Dead Redemption 2: How Wanted Levels Work & How To Avoid Bounties Crime Guide". Gameranx. 1 2 3 4 Rockstar Studios (October 26, 2018). Red Dead Redemption 2. PlayStation 4, Xbox One. Rockstar Games. Scene: Staff credits. ↑ White, Sam (October 24, 2018). "Red Dead Redemption 2: The inside story of the most lifelike video game ever". GQ. Retrieved November 1, 2018. ↑ "We Played 2 Hours Red Dead Redemption 2 – Here's What Happened". IGN. September 20, 2018. Retrieved November 1, 2018. ↑ Hussain, Tamoor (May 4, 2018). "Red Dead Redemption 2 Trailer Shows John Marston And Van Der Linde Gang". GameSpot. Archived from the original on May 4, 2018. Retrieved May 2, 2018. ↑ Orry, Tom; Cryer, Hirun; Wallace, Jamie (June 12, 2018). "Red Dead Redemption 2 Release Date, Pre-Order Bonuses, Editions, Trailers, Characters, PC Version – Everything we Know". USgamer. Archived from the original on June 13, 2018. Retrieved June 22, 2018. ↑ "Red Dead Redemption 2". Rockstar Games. Archived from the original on November 14, 2016. Retrieved November 13, 2016. ↑ Krupa, Daniel (May 4, 2018). "How Rockstar Is Making Its Open Worlds Even Better". IGN. Archived from the original on May 7, 2018. Retrieved May 7, 2018. ↑ Linneman, John (October 3, 2017). "Red Dead Redemption 2's state-of-the-art technology analysed". Eurogamer. Archived from the original on February 15, 2018. ↑ Pereira, Chris (September 20, 2018). "Red Dead Redemption 2: All The Details And News Just Released". GameSpot. Archived from the original on September 20, 2018. Retrieved September 20, 2018. ↑ Saed, Sherif (October 18, 2016). "Red Dead Redemption 2 officially revealed for PS4 and Xbox One, out 2017". VG247. Archived from the original on October 19, 2016. Retrieved October 18, 2016. 1 2 Crecente, Brian (October 18, 2016). "Red Dead Redemption 2 is official". Polygon. Archived from the original on October 19, 2016. Retrieved October 18, 2016. ↑ Makuch, Eddie (October 17, 2016). "Red Dead Redemption 2 Seemingly Teased With First Image". GameSpot. Archived from the original on October 19, 2016. Retrieved October 17, 2016. ↑ Hooton, Christopher (October 17, 2016). "Red Dead Redemption 2 is happening: Rockstar posts Western image". The Independent. Archived from the original on October 19, 2016. Retrieved October 17, 2016. ↑ Morris, Chris (October 18, 2016). "Grand Theft Auto maker announces first game in five years". CNBC. Archived from the original on October 28, 2016. Retrieved October 28, 2016. ↑ Gilbert, Ben (October 17, 2016). "'Grand Theft Auto' is so influential, the company's stock just exploded after teasing a new game". Business Insider. Archived from the original on October 19, 2016. Retrieved October 18, 2016. ↑ Martin, Matt (October 18, 2016). "Of course there's already a petition to bring Red Dead Redemption 2 to PC". VG247. Archived from the original on October 19, 2016. Retrieved October 19, 2016. ↑ Sarkar, Samit (October 20, 2016). "Red Dead Redemption 2 will have something exclusive for PS4 players". Polygon. Archived from the original on October 21, 2016. Retrieved October 20, 2016. ↑ Pereira, Chris (May 23, 2017). "Red Dead Redemption 2's New Release Window Narrowed Further". GameSpot. Archived from the original on July 5, 2017. Retrieved May 25, 2017. ↑ McWhertor, Michael (February 1, 2018). "Red Dead Redemption 2 delayed to October". Polygon. Archived from the original on February 2, 2018. Retrieved February 2, 2018. ↑ McWhertor, Michael (November 26, 2018). "Red Dead Redemption 2 Online launches in beta on Nov. 27". Polygon. ↑ Ryan, Jon (September 19, 2018). "Red Dead Online: Devs Reveal First Details". IGN. Archived from the original on October 3, 2018. Retrieved October 3, 2018. ↑ Skrebels, Joe (September 28, 2017). "Red Dead Redemption 2 Is a Prequel – Story Details, New Protagonist Revealed". IGN. Archived from the original on November 7, 2017. Retrieved November 14, 2017. ↑ Sarkar, Samit (May 2, 2018). "Watch the new Red Dead Redemption 2 trailer right here". Polygon. Archived from the original on May 3, 2018. Retrieved May 3, 2018. ↑ Hussain, Tamoor (August 9, 2018). "Red Dead Redemption 2's New Gameplay Trailer Revealed; Camp, Activities, And More Detailed". GameSpot. CBS Interactive. Archived from the original on August 9, 2018. Retrieved August 10, 2018. ↑ "The Red Dead Redemption 2: Special Edition, Ultimate Edition and Collector's Box". Rockstar Games. June 4, 2018. Archived from the original on June 5, 2018. Retrieved June 5, 2018. 1 2 "Red Dead Redemption 2 for PlayStation 4 Reviews". Metacritic. Archived from the original on October 25, 2018. Retrieved October 28, 2018. 1 2 "Red Dead Redemption 2 for Xbox One Reviews". Metacritic. Archived from the original on January 24, 2018. Retrieved October 28, 2018. ↑ Cater, Chris (October 28, 2018). "Review: Red Dead Redemption 2". Destructoid. Retrieved October 31, 2018. ↑ My Nintendo News Admin (November 3, 2018). "Latest EDGE Magazine Review Scores". My Nintendo News. Retrieved December 8, 2018. 1 2 Plasses, Nick (October 25, 2018). "Red Dead Redemption II Review". Electronic Gaming Monthly. Archived from the original on October 26, 2018. Retrieved October 25, 2018. 1 2 Bertz, Matt (October 25, 2018). "Red Dead Redemption II: An Open-World Western For The Ages". Game Informer. Archived from the original on October 4, 2018. Retrieved October 25, 2018. 1 2 Fillari, Alessandro (October 25, 2018). "Red Dead Redemption 2 Review – Outlaw Country". GameSpot. Archived from the original on October 25, 2018. Retrieved October 25, 2018. ↑ Meikleham, David (October 25, 2018). "Red Dead Redemption 2 review: "When the credits roll, you'll have created enough incredible memories to fill ten lesser games"". GamesRadar. Archived from the original on September 13, 2018. Retrieved October 25, 2018. ↑ Navarro, Alex (October 26, 2018). "Red Dead Redemption 2 Review". Giant Bomb. Retrieved October 31, 2018. 1 2 Reilly, Luke (October 25, 2018). "Red Dead Redemption II Review". IGN. Retrieved October 25, 2018. 1 2 Williams, Mike (October 25, 2018). "Red Dead Redemption 2 review". USgamer. Archived from the original on October 25, 2018. Retrieved October 25, 2018. ↑ "Game releases by score | Metascore | All platforms | All time". Metacritic. Retrieved October 26, 2018. ↑ Suderman, Peter (November 23, 2018). "Red Dead Redemption 2 Is True Art". The New York Times. Retrieved November 24, 2018. ↑ Hamilton, Kirk. "Red Dead Redemption 2: The Kotaku Review". Kotaku. Retrieved October 30, 2018. ↑ Tassi, Paul. "The 'Red Dead Redemption 2' Setting You Need To Change To Make Movement Less Bad". Forbes. Retrieved October 30, 2018. 1 2 Ramsey, Robert. "Red Dead Redemption 2 Review (PS4)". Push Square. Gamer Network. Retrieved October 30, 2018. ↑ Thier, Dave. "The 5 Biggest Problems With 'Red Dead Redemption 2'". Forbes. Retrieved October 30, 2018. 1 2 Tassi, Paul. "'Red Dead Redemption 2' Day 1: Laborious Gameplay In A Stunning World". Forbes. Retrieved November 1, 2018. ↑ Williams, Mike. "Why is Red Dead Redemption 2 Still Using Rockstar's Ancient Control Scheme?". US Gamer. Retrieved October 30, 2018. ↑ "Red Dead Redemption 2 – Red Dead Realism (Jimpressions)". The Jimquisition. Retrieved November 1, 2018. ↑ "Attention To Detail, Obsession With Detail (The Jimquisition)". The Jimquisition. Retrieved November 7, 2018. ↑ Kain, Erik. "'Red Dead Redemption 2' Is Wonderful And Disappointing All At Once". Forbes. Retrieved November 1, 2018. ↑ Grubb, Jeff. "Red Dead Redemption 2 is a disappointment". VentureBeat. Retrieved November 1, 2018. ↑ Reynolds, Matt. "Red Dead Redemption 2 review: so big it feels like a chore". Retrieved November 2, 2018. ↑ Tassi, Paul (February 1, 2018). "'Red Dead Redemption 2' Delayed Again, Terrifying Every Other Game Coming Out This Fall". Forbes. Archived from the original on February 1, 2018. Retrieved February 3, 2015. ↑ Piscatella, Mat (July 9, 2018). "Video Game Industry Predictions for Holiday 2018". The NPD Group. Archived from the original on July 26, 2018. Retrieved August 15, 2018. ↑ Dring, Christopher (October 28, 2018). "Red Dead Redemption 2 UK sales more than double the first game". GamesIndustry.biz. Archived from the original on October 29, 2018. Retrieved October 28, 2018. ↑ Romano, Sal (October 31, 2018). "Media Create Sales: 10/22/18 – 10/28/18". Gematsu. Retrieved November 3, 2018. ↑ Sarkar, Samit. "Red Dead Redemption 2 tops 17 million copies shipped". Polygon. Retrieved January 5, 2019. ↑ Parker, Ryan (October 30, 2018). "'Red Dead Redemption 2' Breaks Records With $725 Million Opening Weekend". The Hollywood Reporter. Retrieved November 3, 2018. ↑ "Red Dead Redemption 2 Achieves Entertainment's Biggest Opening Weekend of All Time". Business Wire. October 30, 2018. Retrieved December 10, 2018. ↑ Dring, Christopher (February 6, 2019). "Take-Two beats targets as Red Dead Redemption II shipments reach 23 million". Gamesindustry.biz. Retrieved February 6, 2019. ↑ Goldberg, Harold (October 14, 2018). "How the West Was Digitized: The making of Rockstar Games' Red Dead Redemption 2". Vulture. Archived from the original on October 17, 2018. Retrieved October 16, 2018. ↑ Schreier, Jason (October 15, 2018). "'We Were Working 100-Hour Weeks,' Red Dead Redemption 2 Head Writer Says, Then Clarifies". Kotaku. Archived from the original on October 16, 2018. Retrieved October 16, 2018. ↑ Webster, Andrew (October 15, 2018). "Rockstar says senior staff chose to work excessive hours on Red Dead Redemption 2". The Verge. Archived from the original on October 17, 2018. Retrieved October 16, 2018. ↑ Phillips, Tom (October 15, 2018). "Rockstar attempts to defuse 100-hour work week controversy amid storm of criticism". Eurogamer. Archived from the original on October 16, 2018. Retrieved October 16, 2018. ↑ Frank, Allegra (October 15, 2018). "Rockstar responds to blowback over Red Dead Redemption 2 team's '100-hour' workweeks". Polygon. Archived from the original on October 17, 2018. Retrieved October 16, 2018. ↑ Bailey, Dustin (October 16, 2018). "Rockstar boss says no one is "forced to work hard" after mentioning 100-hour weeks". PCGamesN. Archived from the original on October 17, 2018. Retrieved October 16, 2018. ↑ Phillips, Tom (October 26, 2018). "The human cost of Red Dead Redemption 2". Eurogamer. Archived from the original on October 27, 2018. Retrieved October 27, 2018. ↑ Schreier, Jason (October 23, 2018). "Inside Rockstar Games' Culture Of Crunch". Kotaku. Archived from the original on November 29, 2018. Retrieved December 11, 2018. ↑ "YouTube U-turn over Red Dead Redemption 2 suffragette clips". BBC News. November 8, 2018. Retrieved November 9, 2018. ↑ Fogel, Stefanie (November 8, 2018). "YouTuber Temporarily Suspended For Video of Suffragette Killing in 'Red Dead 2'". Variety. Retrieved November 9, 2018. ↑ Hernandez, Patricia (November 8, 2018). "YouTube reverses ban for streamer who killed Red Dead 2 feminist". The Verge. Retrieved November 9, 2018. ↑ Robinson, Adi (January 14, 2019). "Red Dead Redemption 2's Pinkerton agents are at the center of a lawsuit". The Verge. Retrieved January 14, 2019. ↑ Stark, Chelsea (December 1, 2016). "The Game Awards: Here's the full winners list". Polygon. Archived from the original on November 26, 2017. Retrieved November 14, 2017. ↑ London, Andrew (September 21, 2017). "Voting is now open for the Golden Joystick awards". TechRadar. Archived from the original on September 24, 2017. ↑ Chalk, Andy (November 17, 2017). "Here are your 2017 Golden Joystick Award winners". PC Gamer. Archived from the original on November 18, 2017. ↑ Alexander, Julia (December 7, 2017). "The Game Awards crowns The Legend of Zelda: Breath of the Wild best game of 2017". Polygon. Archived from the original on December 8, 2017. ↑ Senior, Tom (October 26, 2018). "Vote for the ultimate game of 2018 in the Golden Joystick Awards". PC Gamer. ↑ Sheridan, Connor (November 16, 2018). "Golden Joystick Awards 2018 winners: God of War wins big but Fortnite gets Victory Royale". GamesRadar+. ↑ Grant, Christopher (December 6, 2018). "The Game Awards 2018: Here are all the winners". Polygon. Retrieved December 7, 2018. ↑ Sorrentino, Mike (December 9, 2018). "2018 Gamers' Choice Awards: How to watch, nominees, winners". CNET. ↑ "Your 2018 Winners". Australian Games Awards. December 19, 2018. ↑ Keyes, Rob (January 3, 2019). "2018 New York Game Awards Nominees Revealed". Screen Rant. ↑ Grayshadow (January 23, 2019). "NY Game Awards 2019: List of winners". NoobFeed. Retrieved January 23, 2019. ↑ Crecente, Brian (January 10, 2019). "'God of War' Leads DICE Award Noms, Followed by 'Marvel's Spider-Man'". Variety. ↑ "Nominee List for 2018". National Academy of Video Game Trade Reviewers. February 11, 2019. ↑ Trent, Logan (February 11, 2019). "Here Are Your 2019 SXSW Gaming Awards Finalists!". South by Southwest. ↑ Good, Owen S. (January 4, 2019). "Red Dead Redemption 2 tops list of Game Developers Choice nominees". Polygon. Wikimedia Commons has media related to Red Dead Redemption 2.